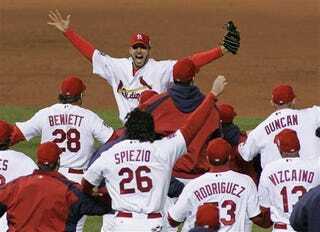 When Adam Wainwright throws the first pitch to Jacoby Ellsbury at 7:07 PM Central time tonight he will be kicking off Busch Stadium's last hurrah for 2013. This Cardinals team has become just another potential dynasty in baseball with a seemingly unlimited reservoir of young talent on the mound and in the field, and they have a chance to add another title to their miracle run just two years ago. The narrative for Wainwright is common knowledge, as he transformed from the rookie who closed out the 2006 World Series to a legitimate ace headlining a young pitching staff that has St. Louis just two wins from another title. The narrative for his counterpart is a little trickier, as Jon Lester has had a roller coaster career in which he has managed to overcome lymphoma to pitch a dominant Game 1 just last Wednesday. Once almost traded for Johan Santana, Lester was near the elite for 2008-2011, but the last two seasons have seen him right around league average. This postseason has seen him back to form, giving up 5 earned in 27 innings and winning three of his four starts. It is fair to say that anyone confident in what he will do tonight is either a liar or a Cardinals fan, and while this start will surely provide sportswriters with a referendum on his season, let's all just hope that he matches Wainwright pitch for pitch, however that may go. As for beer, there is an excellent craft brewery in St. Louis called Square One that deserves some attention. In fitting with the color schemes of this series, I recommend finding a Double Red dark amber ale. Described as their English version of an I.P.A. with a nice, malty flavor, this would be my beer of choice to enjoy this game if I could get my hands on it. Let's hope this game matches the excitement of the last two nights, and as always, enjoy the game. Please, just drink anything but a Busch.